Projecting the rate of new technology adoption is critical for determining what products should be developed and sold. In the surveillance market, significant skepticism about adoption is common. You often hear people criticize H.264 uptake ("it's been around forever but only now being used in surveillance"), video analytics use ("it's just a feature") and IP cameras ("over a decade and still only used by a distinct minority"), etc. Because surveillance depends on integrating systems, the introduction of any new component faces fundamental barriers, regardless of performance. Performance: This is the most common metric cited - how accurate, how reliable, how cost effective, etc. is the technology? Integration: This is infrequently emphasized but more challenging: Even if the technology performs well, how difficult is it to add the technology to existing deployments? Integration barriers will hold back any new component that requires changes to an overall surveillance system (both IP and HDcctv cameras are good examples of this). This is essential as most users already have surveillance systems in place and make decisions based on the relative cost and complexity of modifying those systems to utilize the newer technology. Analytics also have an integration problem. How do you add analytics to an existing system? Only a very small minority of DVRs or cameras support loading analytics. Most users are required to buy new cameras, encoders, servers or DVRs. Even if performance is great and users see the value, such major steps hold back buyers. When a sales pitch results in a customer being excited about a new technology, the reality that kills most deals is being able to integrate it with their existing systems. We've seen this countless numbers of times when a user responds to an analytics pitch saying, "This is great. Can I run this on my Intellex, Pelco DX8100, Bosch DVR, etc.?" Once you tell them you need to buy a new DVR or another server, most of them cannot justify the purchase. Integration barriers constrain the maximum growth rate but do not doom a new technology. Some will find the money or be at the right place in their upgrade cycle. However, most will not. This drags out the cycle. One of the most interesting argument against IP cameras is "Buyers have clearly shown with their purchases that they do not want IP cameras. Analog camera sales continue to dominate." In economics, this is called 'revealed preference theory', i.e., listen to what people do rather than what they say. 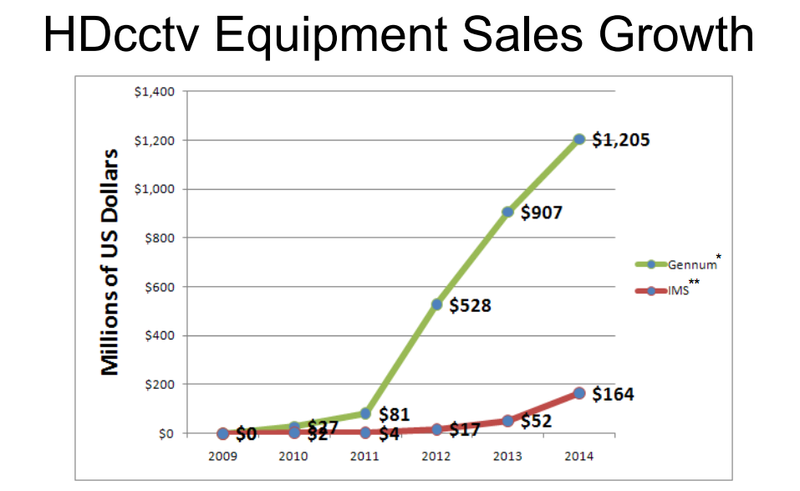 Despite this, it remains clear that IP camera sales growth remains robust. The question, then, is given that IP cameras have been around for more than a decade why has it taken so long? The answer for IP camera uptake is certainly a mix of performance and integration barriers. For most of the last decade, IP cameras could not compete with the image quality of analog cameras. As such, regardless of the cost or ability to integrate with existing systems, most buyers had little interest. However, in the last few years, the situation has flipped - IP cameras generally offer better (or at least equal) image quality. The main performance barrier is now price / competitive cost effectiveness. The problem that still remains for IP cameras is integrating with existing systems. IP cameras are not backwards compatible with legacy DVRs. Since those DVRs are the majority of systems in use around the world today, IP cameras are mostly shut out of those systems. Unless and until those users decide to do a major upgrade, analog cameras will remain the product of choice regardless of the user's interest in IP cameras. After a decade, integration barriers are finally reducing. The rise of hybrid DVRs and VMS software make it simple to add in IP cameras. Each year, as more systems go through their upgrade cycles, the barriers diminish. However, it will still certainly take most of this decade to finish 'cycling' through. HDcctv is an interesting example because it is the newest surveillance technology offering. From a performance perspective, HDcctv risks are relatively minor. Since they are using fairly mature sensors and internal components, image quality is likely to be strong (unlike early IP cameras). As with all new technologies, some performance issues will exist but these will be straightforward to address - the availability of products, pricing of products, etc. While it is not assured that they can overcome them, it is certainly feasible if executed properly. The big problem for HDcctv is integration barriers. Currently, 0% of existing surveillance systems support HDcctv cameras. Anyone who wants to use an HDcctv camera needs to make a major investment in additional products beyond HDcctv cameras. HDcctv spokespeople say, "All you need to do is change the camera and recorder and you are done." Requiring users to change their recorder is a huge barrier for HDcctv. This will be the same barrier for HDcctv as it was (and continues to be) for analytics and IP cameras. HDcctv salesmen will make their pitch, users will respond, "Wow, that's great video quality. Can I use this with my existing Intellex, Pelco or Bosch DVR?" Interest will drop as prospects realize that they need to buy new recorders. This is not a HDcctv issue. It is a system integration / switching cost barrier. Compounding the barrier will be that Hybrid DVRs supporting both IP and analog cameras are already so common and more flexible. For the small number of users each year doing major upgrades or greenfield purchases, HDcctv needs to compete with a more mature substitute - Hybrid DVRs. Unlike HDcctv that requires fixed inputs for each HDcctv or analog camera, Hybrid DVRs can generally mix and match analog or IP camera feeds. The HDcctv Alliance is projecting a 650% growth rate from 2011 to 2012 ($81 Million to $528 Million from their 3rd to 4th year in existence). Such massive jumps in percentage and total value (the global market is less than $10 Billion) is simply impossible. Barriers in performance improvements and integration constraints do not allow any technology in the surveillance market to ramp up that quickly. While many argue that surveillance is a conservative market, we think a more important factor is the need to integrate new technologies with existing surveillance systems. This might make the market appear conservative but it is a rational response to challenges in adding in new components. We believe this has slowed all major new surveillance techologies and will continue to do so for new ones.